I’ve been getting lots of requests for another set of printable puppets, so I asked my kids what I should make and after a lot of crazy suggestions (does anyone know a Yoda song?) we finally settled on jellyfish, three of them! 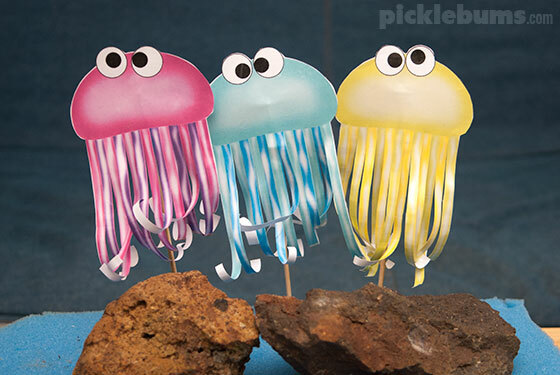 Here are our Three Jelly Fish Printable Puppets! Do you know the Three Jelly Fish song? It’s one of our favourite counting songs with great actions and it’s lots of fun to sing and act out. We set up our jelly fish with some rocks and shells on a piece of blue foam for the water. We had lots of fun making the jelly fish do crazy things and make crazy sounds as they fell into the water and then climbed back up on their rock. If you don’t know the Three Jellyfish song, Morgan and I made a quick video for you. It involves a fair bit of toddler induced camera shake, as well as my less than perfect singing, but Morgan is rather impressed with our efforts and so am I. And I am, standing behind my belief that little kids don’t care if you can sing or not, they just care that you DO sing. So if I can share my singing voice with the whole internet, you can definitely share yours with your kids! 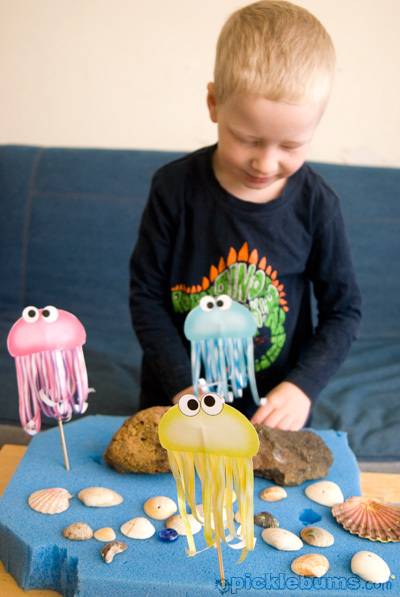 You can download the three jelly fish puppets here. This is an A4 sized pdf document – if you are printing on US letter sized paper make sure you select ‘fit’ or ‘shrink to fit’ from your printer options. Simply download the pdf, print it and cut around the outline of each jellyfish. Then cut between each tentacle and roll the tentacles around a pencil to give them some curl. Attach them to a suitable stick, we used bamboo skewers but you could use chop sticks or even sticks from the garden. 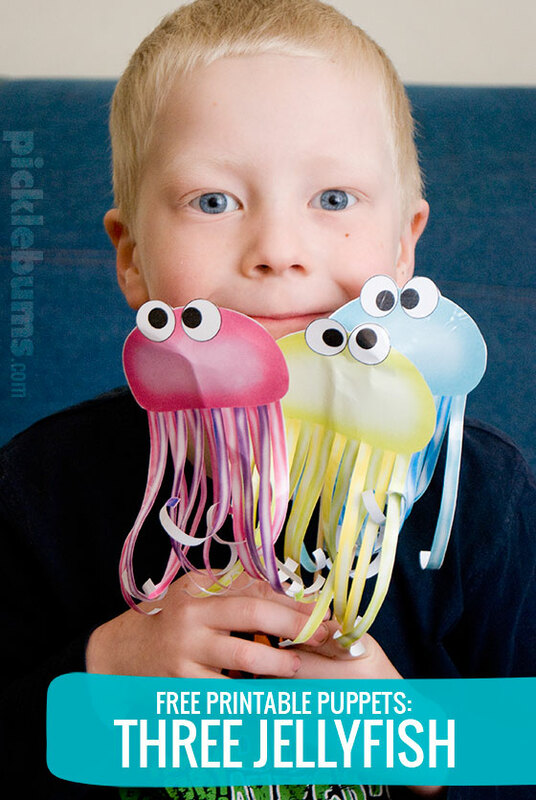 We covered our jellyfish in contact paper on one side before cutting them out so they are a bit more robust for toddler hands, but covering both sides means the tentacles don’t curl as well, so best stick to one. What is your favourite counting song? The jellyfish are gorgeous! Loved the video! Love your jellyfish and the video! Thank you so much for this post. I want to let you know that I posted a link to your blog in CBH Digital Scrapbooking Freebies, under the Page 4 post on Nov. 17, 2011. Thanks again. This is just fantastic Kate! Another fanatatsic resource. I’m downloading them on the weekend and linking to it when I finally write a linky love post! Morgan is MUCH better and everyone is VERY keen to come up to the beach in the holidays! Thanks so much for these Kate, My kids were transfixed by your video. They remember the jelly fish song from swimming lessons last year. So fun! I’ll use this at a library story time. THANKS for the music video. : ) I believe what you say about singing. Love the jellyfish! Thanks- I used the printout with students in my speech/language sessions. They were a big hit!!! Kate, you are too clever. These are cute as! Thanks for sharing them and this song with us. haha love them.. My Boy Blue loves this song.. I will be printing these out for sure once we get moved and have a printer again! Hi, Just wanted to thank you and Morgan so much for the wonderful printable puppets!!! We love them and really hope that you keep making more! You have Frogs, Ducks, and now Jellyfish…maybe you could create one for each letter of the alphabet?! Thank you again!!! Loved your singing!! : ) Thank you for the printables – I’ll be printing them out fotr my grandkids! All of your little puppets are wonderful!! 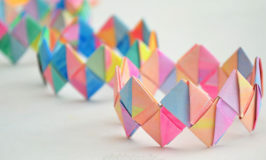 I am a piano teacher, and I’m going to make these for a Piano Readiness Class of 4-year-olds. Thanks SO much for sharing! Hi Kate, thanks for sharing your video :) my 2.5 year old loves watching it and has asked for it to be played again and again. Would like to make the jelly fish puppets for her. Is this printable still available? Clicked on the link but it went to an error page. So sorry the link went dead! I’ve updated it and you can now follow the link and download the pdf or print it straight from the page by clicking the little printer icon at the bottom right of the image box. 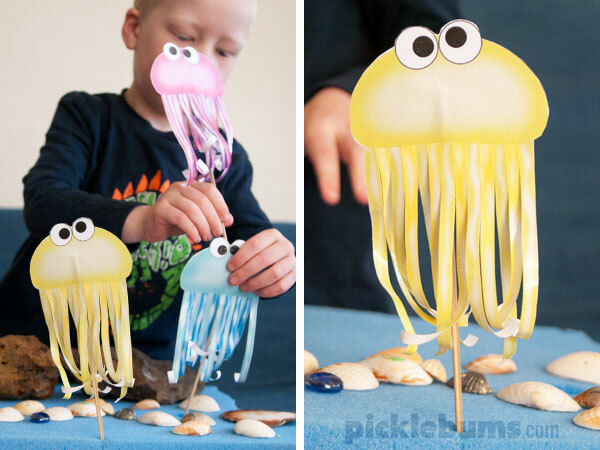 Can’t wait to make these jelly fish and sing the song with my 3yr. old preschool class in Aug. when we do our ocean theme. Thanks so much for the creative idea. 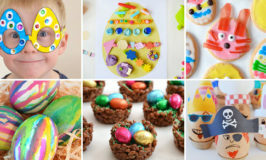 I know I will like making these and my students will enjoy using them too. 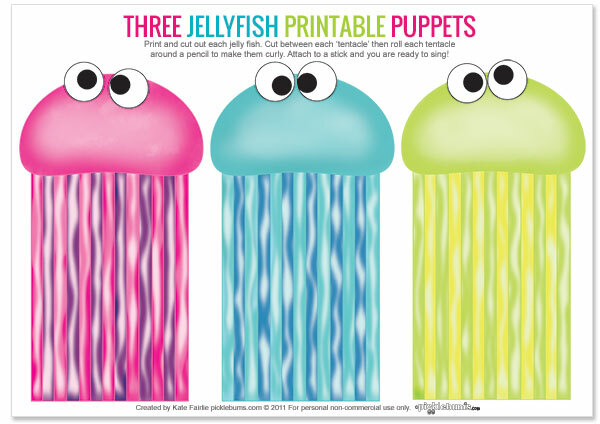 Home » Three Jellyfish Printable Puppets!